Bill de Blasio is welcoming Amazon to New York City with open arms — proving that his progressive reputation was always a sham. 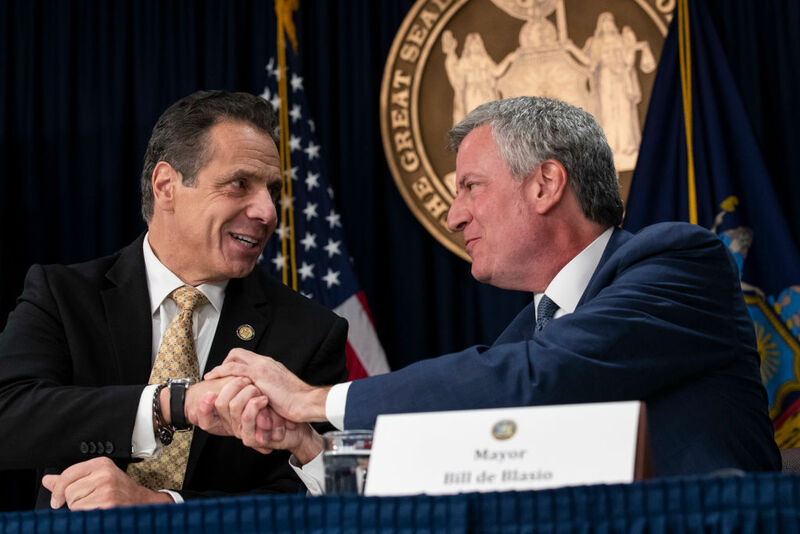 There was something very telling about New York City mayor Bill de Blasio’s public schedule the week he and Governor Andrew Cuomo announced a new Amazon headquarters in Long Island City, Queens. Some days, the mayor had no public events. He made a few media appearances and answered questions about the city’s botched response to a November snowstorm, but for the most part, de Blasio was missing in action around the city. It was almost as if he was hiding from New Yorkers who are outraged about this new corporate boondoggle giving away billions to one of the world’s largest corporations to locate its “HQ2” offices in Queens. In a highly controlled press conference with the governor and direct interviews with reporters, de Blasio justified the deal with vague assurances of economic growth and arguments that New York City was still better than all the other second-rate cities making concessions to lure the online retail giant. He did this all as his administration fumbled the easiest of problems, facing a mild snowstorm that resulted in unnecessary transport delays around the city. This on the heels of a scandal around the city’s inability to provide proper school busing for Queens public school children — incidentally, it was also reported that the Amazon headquarters would force the eviction of the city’s Office of Pupil Transportation, one of the many insults associated with this nearly $2 billion subsidized corporate deal that will bypass normal public oversight procedure. It’s no surprise that Cuomo, a centrist, pro-business Democrat, drooled publicly over the prospect of the company coming to the city, joking that he would change his name to Amazon Cuomo if he had to. But de Blasio came into power promising to fix income inequality. This deal is a billion-dollar betrayal of that promise. Long Island City is far from a wasteland in need of development. Already home to the Citigroup building and numerous city government offices, it has developed an almost Dubai-like landscape of high-rise residences, given its proximity to midtown Manhattan. The neighborhood was not in desperate need of a new employer like Amazon. Yet the deal allots $48,000 in public money to Amazon for every job it creates. Meanwhile, austerity measures continue apace in the city. New York teachers recently settled a contract with raises that barely meet inflation. The New York Times recently reported that the city is considering partially privatizing public housing management, and subway riders, already beyond frustrated with delays and overcrowding, may see another fare hike. The city’s working class and poor continue to suffer blow after blow as de Blasio’s administration hypes the Amazon deal — a deal with no requirements for Amazon to hire locally or become more union-friendly. The question so obviously begged here: how can an elected official like de Blasio, who ran on ending a “tale of two cities,” and constantly trumpets his supposed progressive credentials, so nakedly enact neoliberal austerity? De Blasio’s stated justifications are flimsy. He pointed to the new headquarters’ proximity to the Queensbridge public housing complex, promising that “the synergy is going to be extraordinary,” invoking a corporate buzzword that means absolutely nothing. He mumbled something about Karl Marx being pro-development. He stated opposition to Walmart’s labor abuses but excused Amazon’s on grounds that it was a major part of the economy: “Whatever you like or dislike about Amazon, Walmart is an entirely different universe, in terms of the systematic efforts that they have undertaken to not only undermine labor, small businesses, the environment, American workers” — a statement so patently absurd it is almost inconceivable that he believes it. What seems clear is that the mayor hasn’t really given the deal and where it fits into his touted progressive credentials much thought. This is de Blasio’s last term, and his legacy is already built on things like universal pre-K and police reforms. If history is any guide, he is unlikely to move on to a higher office — no New York City mayor has done so in the last century, though a few have tried. There’s no real motivation for him to sell himself as a strong progressive. He’s not running for anything, so he no longer has to. And so Queens residents will soon have to brace for the consequences, as Amazon’s giant, highly paid professional staff will increase housing prices and drive out the working class, especially the immigrants who make the borough the lively place it is. Both de Blasio and Cuomo have happily handed over massive amounts of public money to Jeff Bezos, transferring public resources away from education, infrastructure, and housing to the globe’s wealthiest man. De Blasio was elected mayor, beating out other heavy-hitting Democrats in a crowded primary, largely because he promised to end the “tale of two cities.” Many leftist critics disregarded this slogan as mere empty sloganeering. With this enormous giveaway to the world’s richest man while critical economic and public service problems persist, de Blasio is proving those critics right. Ari Paul is a journalist in New York City who has covered politics for the Nation, VICE News, the Guardian, the Forward, the New York Observer, Al Jazeera America, and the Brooklyn Rail.